By Dr Jaap van Ede, editor-in-chief Business-improvement.eu, 05-06-2018. The Toyota Kata approach, with mentors and mentees applying coaching and improving behavior routines respectively, continuously increases the problem solving abilities of the mentees. This supports the Lean goal of all people helping to improve every day. 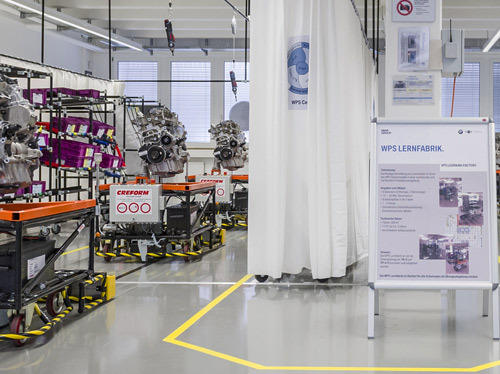 BMW’s process improvement system is called Value-added Production System (VPS), or in German language: Wertschöpfungsorientiertes Produktionssystem (WPS). Rothers’ Coaching Kata is a behavior routine for managers in a Lean coaching role, see the box Toyota Kata. One of the important aspects is that Lean coaches ask Socratic questions, instead of telling people what to do. That way, they are challenged to solve problems on their own. The main aim of the coaching process is to keep the mentee within the corridor of the so-called Improvement Kata, which is equivalent to Lean behavior and thinking. ‘We did not copy the Kata’s described in Rothers’ book, but developed a version that is tailored to BMW’, adds Grüneisl. In 2010, Mike Rother published his book Toyota Kata. Kata, a Japanese word for form, refers to patterns of movements, for example in martial arts. In the book, the word Kata describes behavior routines to deal with dynamic and unpredictable circumstances on a route to improvement. Striving towards a distant business goal resembles climbing a mountain in darkness with only a small flashlight. Then you can only see a small part of the route to be covered. Planning and executing big improvement steps then makes little sense. It is better to take many small but quick improvement steps, during which you climb and the next part of the route becomes increasingly clear. The Improvement Kata describes the optimal behavior of the climber/improver, and the Coaching Kata describes what his or her mentor/coach should do to make sure that the climber displays the correct behavior. According to Rother these two behavior routines determine how people within Toyota strive iteratively towards Target Conditions. This brings this company step-by-step closer to a Vision, along a route that is a priori unclear and full of hidden obstacles. Toyota turns out to be an organization in which everyone is a problem-solver, displaying ‘improvement kata behavior’, guided by a coach, displaying ‘coaching kata behavior’. The Improvement Kata is a set of behavior guidelines which are learned by doing. To this end you are coached by a more experienced person, a mentor or a sensei. Teaching how to improve is done via a mentor/mentee dialogue, which Rother calls the Coaching Kata. A mentor guides his or her mentee through the Improvement Kata. The teaching process has the aim to keep a mentee within the corridor of the Improvement Kata, by asking Socratic type of questions. Within BMW, people within one production unit – at the same level - communicate and cooperate as closely with each other as possible, to obtain the best possible team results. Besides this, people within different management layers are also connected. Employees often have a coach ‘above’ them, and in turn coach people ‘below’ them. A second binding system is Hoshin Kanri, or ‘compass for improvement’ in Japanese. Hoshin Kanri connects higher level goals with lower level goals by way of a cascade of performance indicators. This way, everybody knows how he or she can contribute to business goals, by improving their own work. These two pillars make the system complete. The employees know which things have priority to improve, and they are coached to find improvement opportunities themselves. 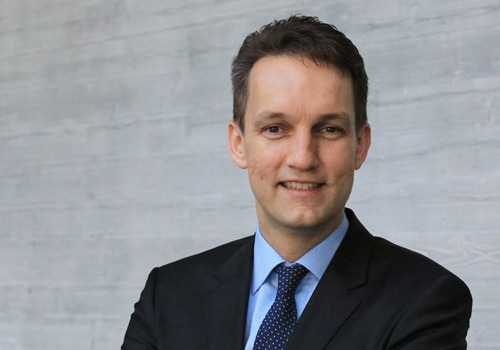 ‘Good leadership creates good people, that create good processes’, explains Grüneisl. 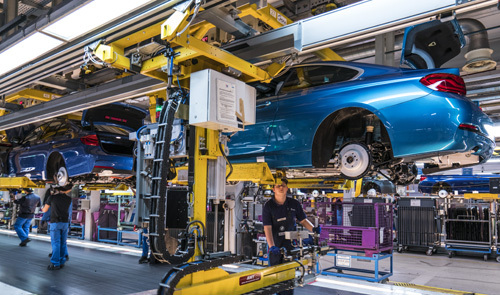 Lean production at BMW in München in One Piece Flow. Different car variants alternate each other. When you buy a BMW, you can choose from many options. As a result, every car is different. Nevertheless, variants of cars are produced in a One Piece Flow, a chain of single piece operations. This means that that for example a convertible car can be assembled after a car with a standard roof. This makes the production planning complex. A Lean production line consists of stations in which people or teams work during one ‘takt’ or cycle time on one product, which is then transferred to the next work station. ‘So, when for example the takt time is 60 seconds, people within a work station always have to finish their task within about 55 to 60 seconds. When every car is a bit different, this is not easy’, says Grüneisl. About one year ago, Audi suggested another solution to cope with the continuously increasing number of model versions and types: modular assembly. The assembly line is then exchanged for production islands, and a driverless transport system which moves car bodies between those islands. That way, cars in the making can call at assembly islands at will, depending on which parts they need. Every car follows its own route over the production floor, which makes the production far more flexible. A good idea, this smart industry solution, or industrie 4.0 in German? 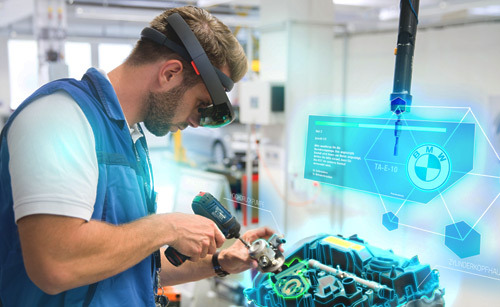 This does not mean, that BMW thinks that industrie 4.0 isn’t useful, see for example the augmented reality glasses in the picture above. Value streams, processes with value adding steps connected optimally with each other, are being designed on a ‘higher’ management level. The operators focus on finding improvements daily. One of the popular tools to realize local improvements is simple automation, or in German language Einfachautomatiserung. Examples are a screwdriver which magnetically attracts screws from a box, just at the time when an operator needs them, or automatic guided vehicles taking care of material supply.